Cambridge SP has just published the a book, edited by Aida Vallejo and María Paz Peirano. 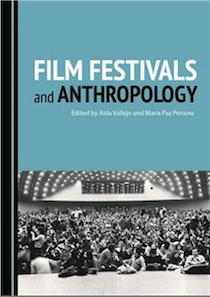 This collection explores the intersections between anthropology and film festival studies. Film and anthropology scholars map ethnographic film festivals and ethnographic approaches to festivals worldwide. The book provides a historical reconstruction of most of the main festivals exhibiting ethnographic film, considering the parallel evolution of programming and organisational practices across the globe. It also addresses the great value and challenges of ethnographic research tools for studying the wide-ranging field of film festivals. This volume is the first to collect long-term experiences of curating and exhibiting ethnographic film, as well as new approaches to the understanding of film festival practices. Its contributions reflect on curatorial practices within visual anthropology and their implications for ethnographic filmmaking, and they shed light on problems of cultural translation, funding, festival audiences and the institutionalisation of ethnographic cinema. The book offers a novel perspective on film festivals as showcases for cinema, socio-cultural hubs and distribution nodes. Aimed at anthropologists, media scholars, festival organisers and documentary film professionals, it offers a starting point for the study of ethnographic film exhibition within its cultural and social contexts. Aida Vallejo works as Adjunct Professor in Media Studies at the University of the Basque Country, Spain. As a cultural anthropologist, media scholar, documentary expert, and film historian, she has published extensively in international journals on documentary film, narratology, film festivals and ethnography of media. She is the founder and coordinator of the Documentary workgroup of the European Network for cinema and Media Studies, and she has carried out fieldwork at several festivals across Europe and is currently working on a research project that investigates the presence of documentary at film festivals from a global and historical perspective. María Paz Peirano is Lecturer in Film Studies at University of Chile, with a PhD in Social Anthropology from the University of Kent, UK. She trained as a Social Anthropologist at University of Chile and holds postgraduate degrees in both Documentary Film and Film Studies, from University of Chile and Pontifical Catholic University of Chile, respectively. Her research involves an ethnographic approach to film as social practice, focusing on film festivals and the construction of contemporary Chilean cinema in transnational settings. She has recently worked as a postdoctoral researcher at Leiden University, Netherlands, studying the impact of international festivals on Latin American cinema.